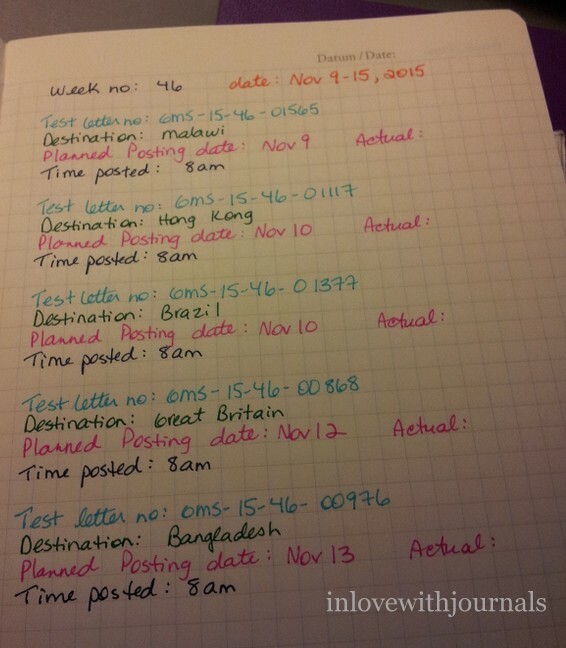 Back in March of 2014 I started processing postal surveys for World-Mail-Panel.com. 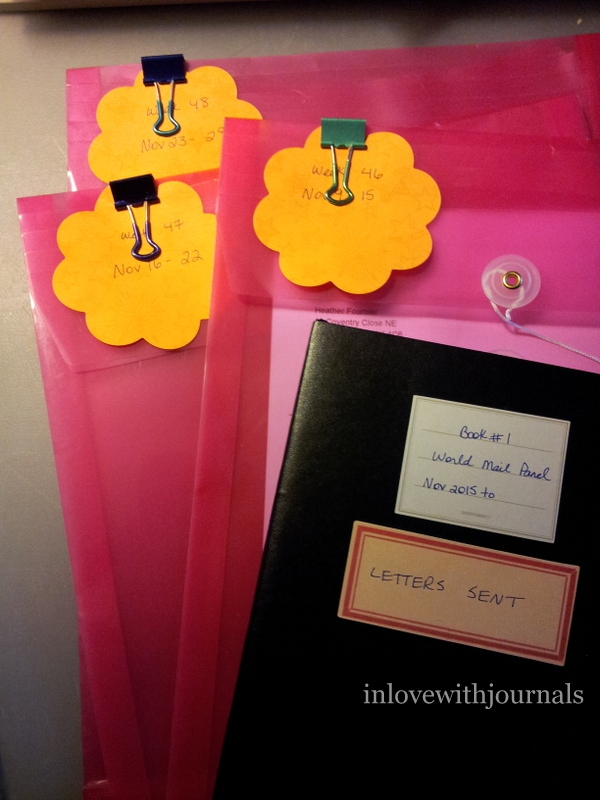 I received letters from all over the world and recorded details about them on the website. I returned electronic transponders to their offices in Germany. 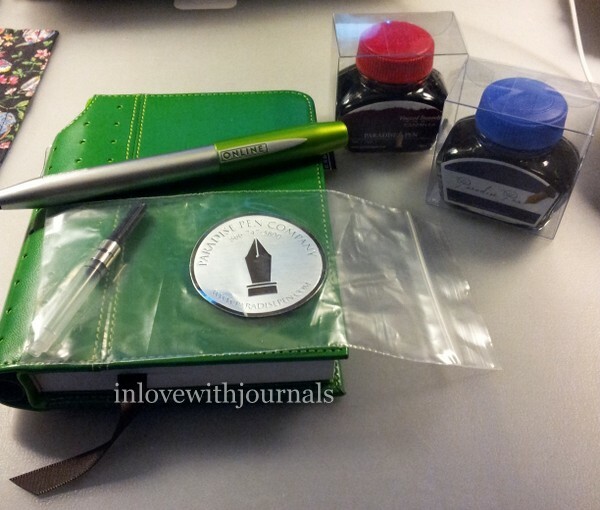 I filled two Leuchtturm jottbooks (one small, one large) with the details and the stamps from all over the world. The small purple jottbook that started it all. 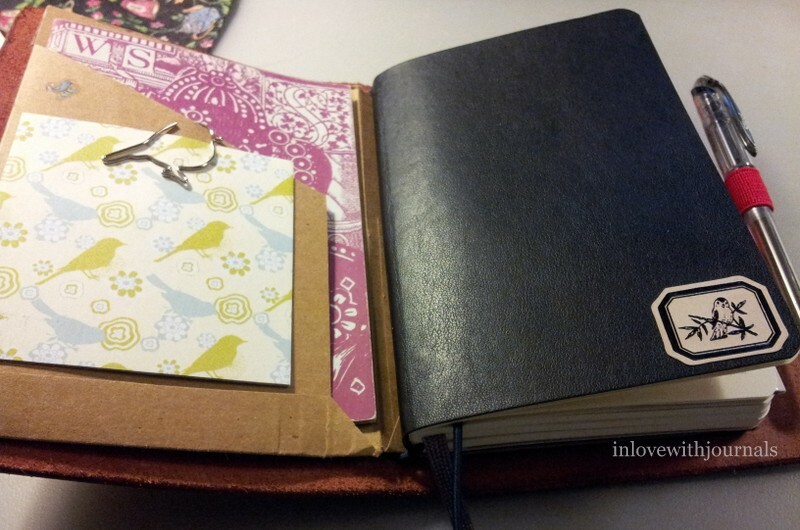 In February of 2015 I finished the first notebook and moved into an A5 jottbook. And then in November of 2015 they asked me to start sending letters as well as continuing to receive them. I agreed and a new notebook was needed. 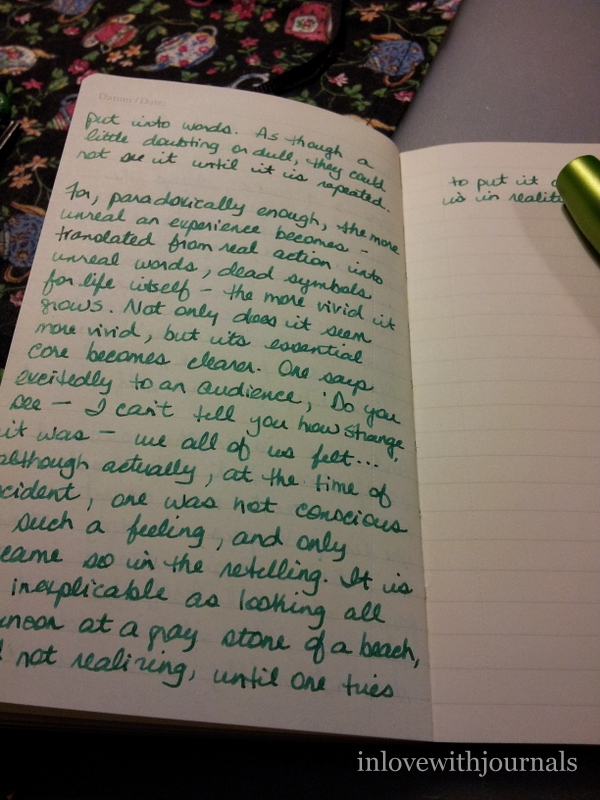 Once again I turned to a Leuchtturm but an actual notebook this time, with the elastic closure and pocket in the back. However I quickly found that it wasn’t needed; for Letters Sent I only had to keep records for a week, whereas for the Letters Received I had to keep those for three months. 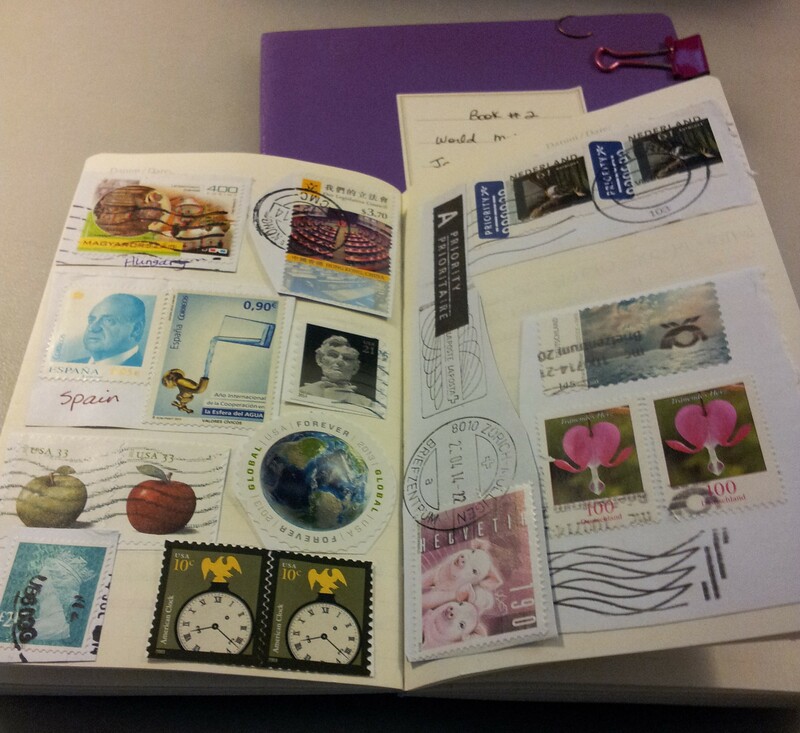 The really fun part was looking at all the stamps from around the world. And I made some money doing all this! 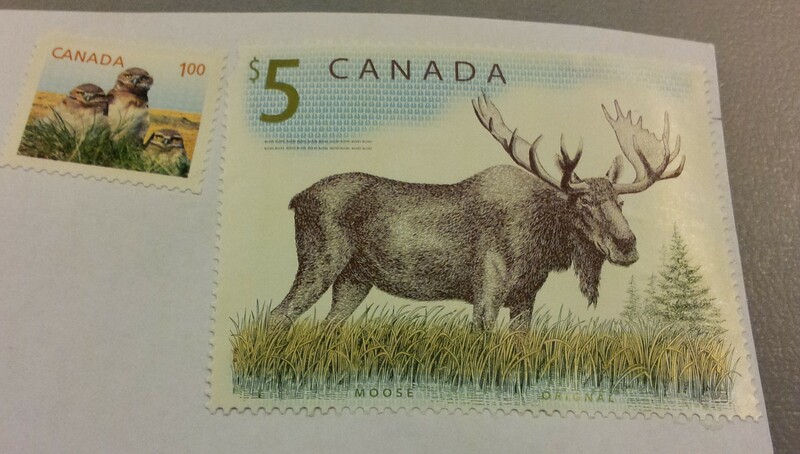 They paid me around $15 Cdn per month to receive the letters and that increased to around $20 when I started sending letters. Since I joined I have redeemed just under $500 in gift certificates for Amazon and credits for my PayPal account. They also offer occasional bonuses based on participation. All of this coming to an end soon. 😦 I notified them in April that I would be moving to a new province, and unfortunately they do not require surveys to be conducted in this demographic. I still receive the occasional letter but it has slowed down to a trickle. I am very close to having enough points to redeem $100 in gift certificates. I am sad because this was alot of fun and very interesting. If any of you are interested check them out at world-mail-panel.com. Maybe someday they will need my services again, and I’ll be ready! Christmas is over for another year and I feel grateful for all of the gifts I received, and wanted to share some of them with you in this post. Here are some goodies I found under my tree. I also got some fairy lights for Christmas and just can’t seem to put them away… 🙂 Clockwise from top left: Ex Libris reading journal by Leuchtturm, unnamed journal, Manufactus leather refillable journal, unnamed journal and Pocket Pal diary. Sorry for the “unnamed” journals; there are no identifying marks on these books but my friend said she bought them because they are just so beautiful, and I totally agree. 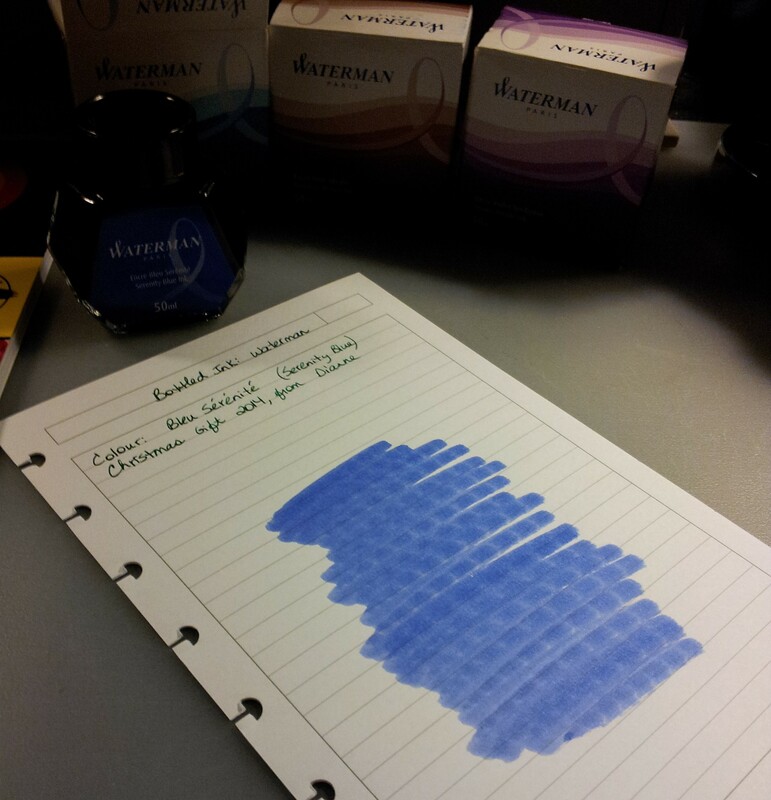 I love anything Leuchtturm does and the Ex Libris Private Reading Journal certainly doesn’t disappoint. 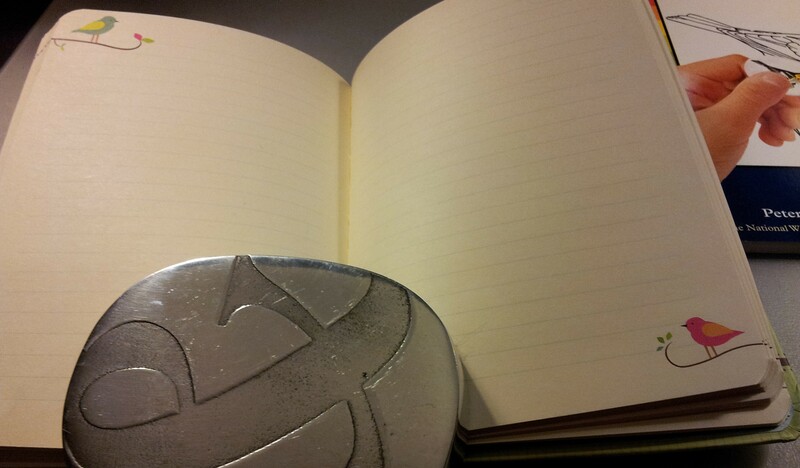 It is hard cover, and measures 8.25″ x 5.75″. My sister gave this to me, after we discovered it in our favourite stationery store earlier this year. 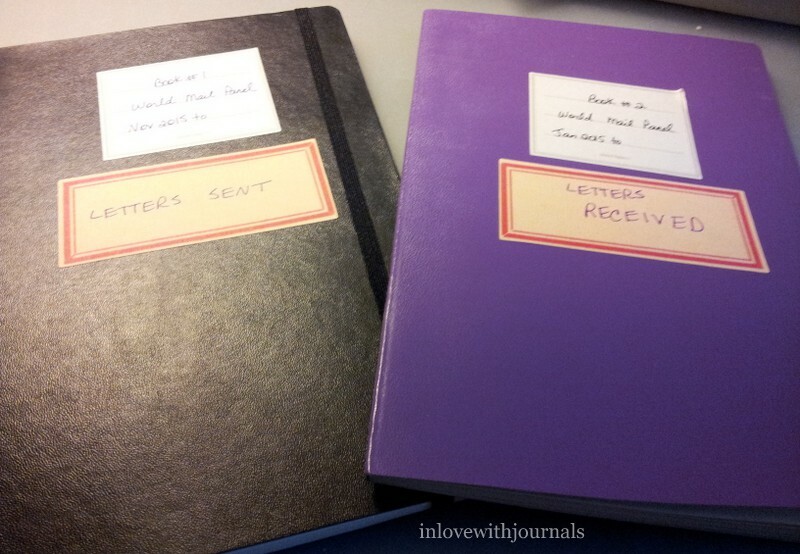 I already have a reading journal but fell in love with this the instant I saw it. Can you have too many? Of course not! A view of the back cover. The red paper cover comes off and the journal itself is all black. Inside the front cover. Lovely thank you from the Sturken family (I presume they own Leuchtturm) and details on the history of the company. It’s hard to see all of the fields but there is space to indicate whether it is a book or an audio book (no box for ebook I see, which is odd), title, author, when and where did you read it, date of publication, original language, genre (this is something I do not currently track and it is an interesting idea), notes/quotations, appraisal from 1 to 6 (checkboxes), gift from/discovered by, and gift to. 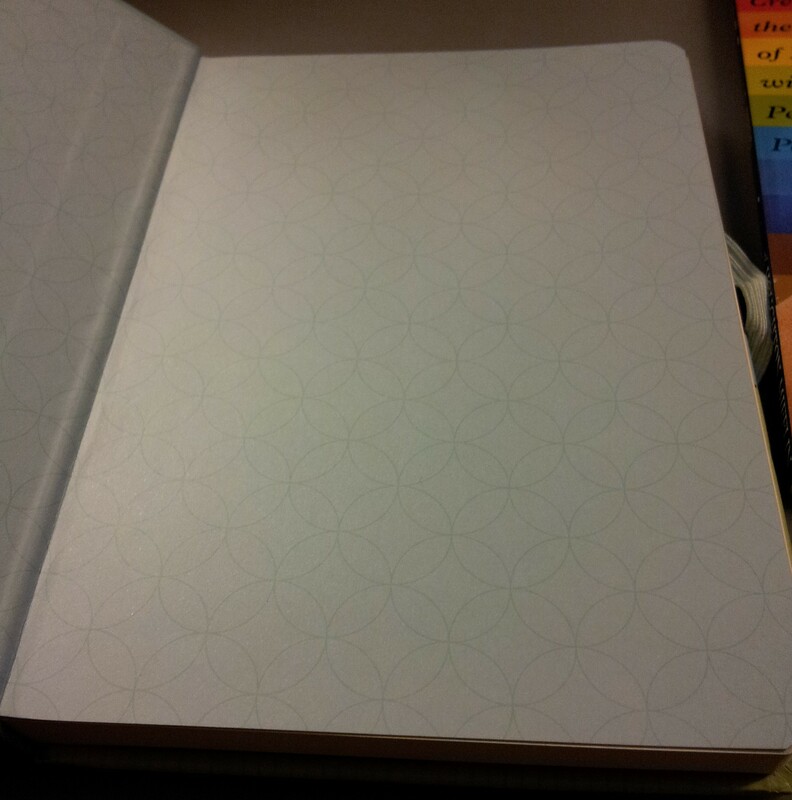 The paper, as with all Leuchtturm products, is amazing. Each page is numbered. There is no Contents page but rather an index at the back, which I will get to. 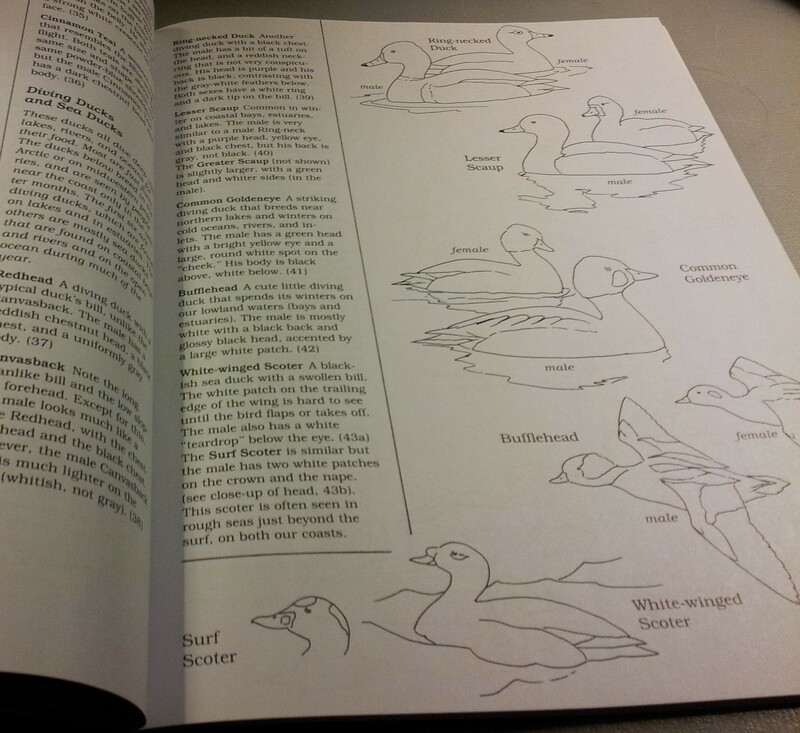 Most of the book is made up of these pages; they go to page 156. And that’s where the page numbers end, which is not what I would have expected. Then there are three sections, with about a dozen pages each: To Read, To Give (great idea), and Lent To/Borrowed From, followed by about 20 pages of simple lined paper, for whatever you want. At the very back of the journal is an index. 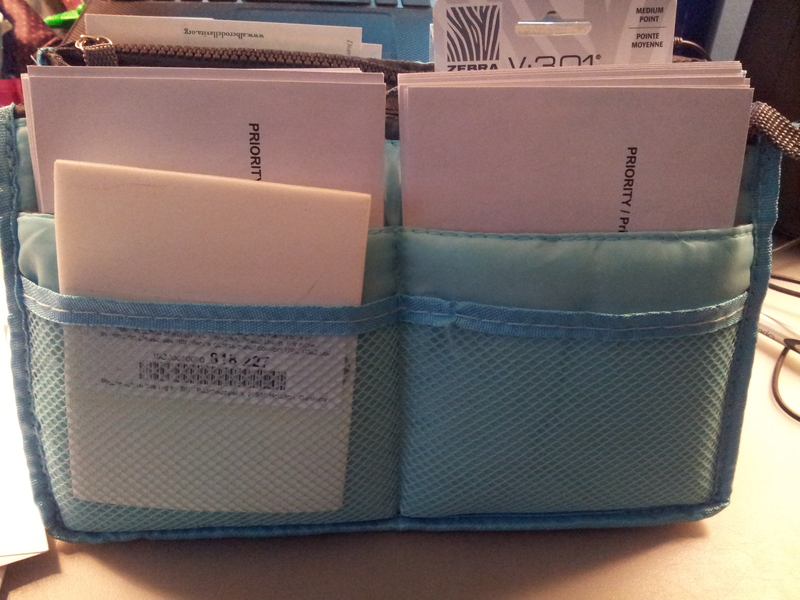 It looks like an address book and you can file books by title and/or author using the lettered tabs. I think this is a fantastic space saving idea, as I currently have a Title Index and an Author Index in my reading journal, which is my own design. 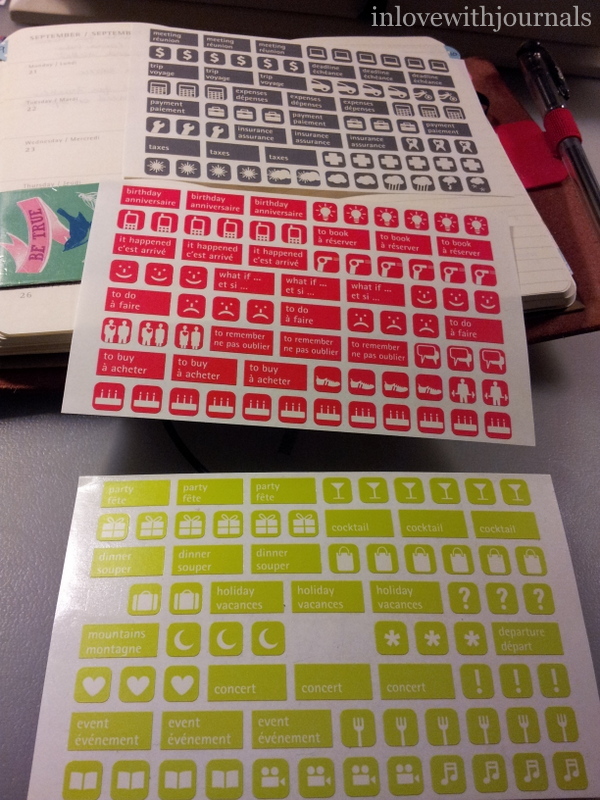 There are also stickers included, as with all Leuchtturm notebooks, for labeling the front and sides of the notebook. All in all it’s a very beautiful and useful reading journal, a great gift for the reader in your life. Or for yourself! Let’s move on to some stunning smaller notebooks, which measure 5.5″ x 3.5″. I love using this type of notebook in my purse for quick notes. Gosh the lighting makes it seem to glow! When I first saw these I thought they were Paperblanks. I don’t think they are, although they aren’t labelled as anything. The gilded pattern is raised, so it feels embossed. The material feels like a vinyl or thin plastic. 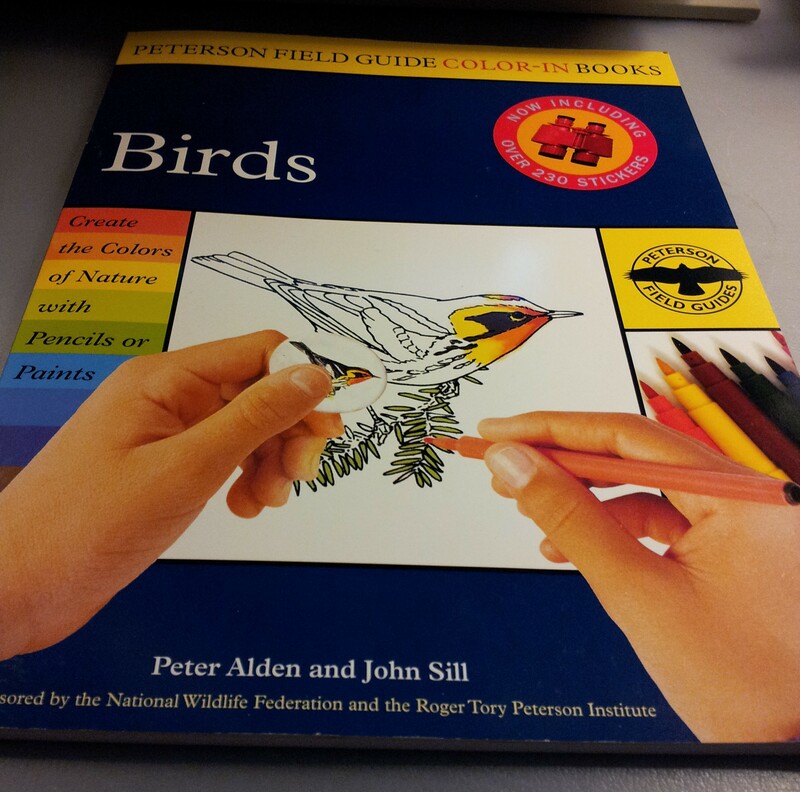 The pages are blank and the paper is really great quality. 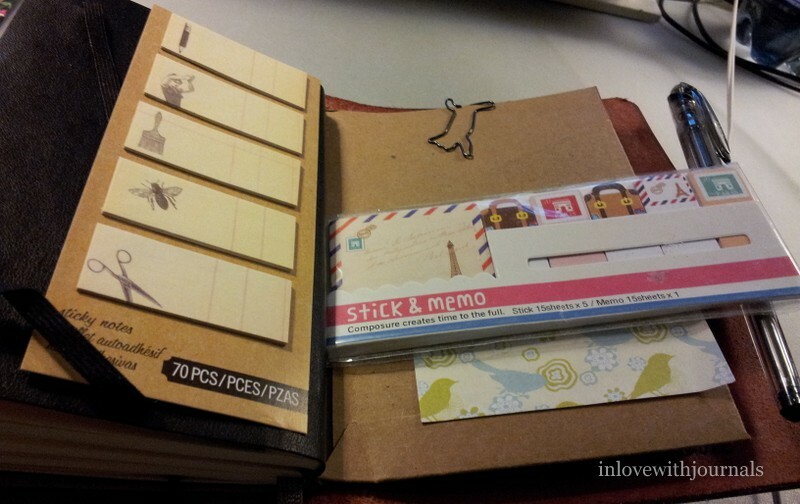 And each notebook has a ribbon bookmark. 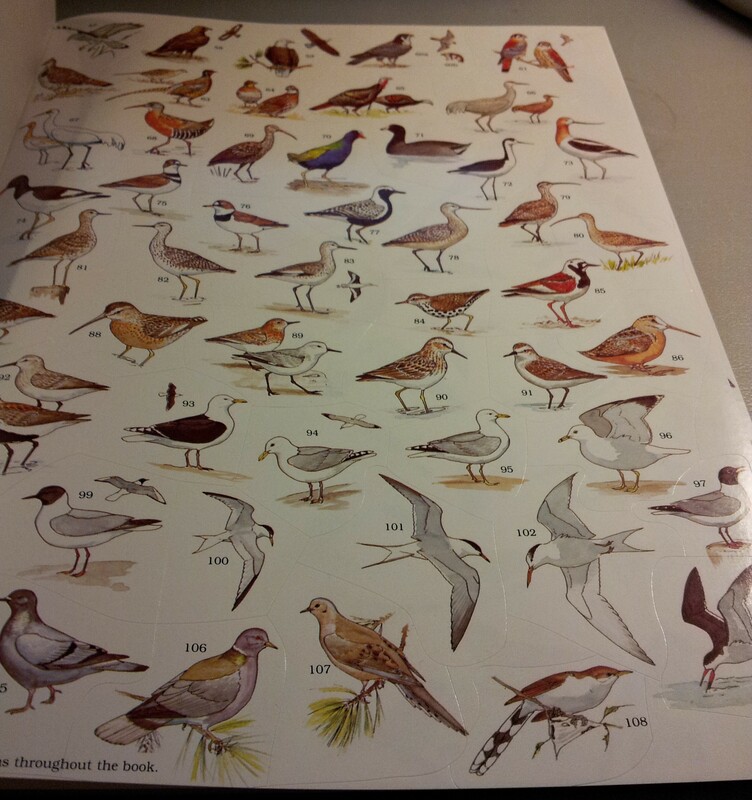 The pattern continues on the back cover. This one is definitely a cloth binding. Such an amazing cover! And the pattern is once again continued on the back. 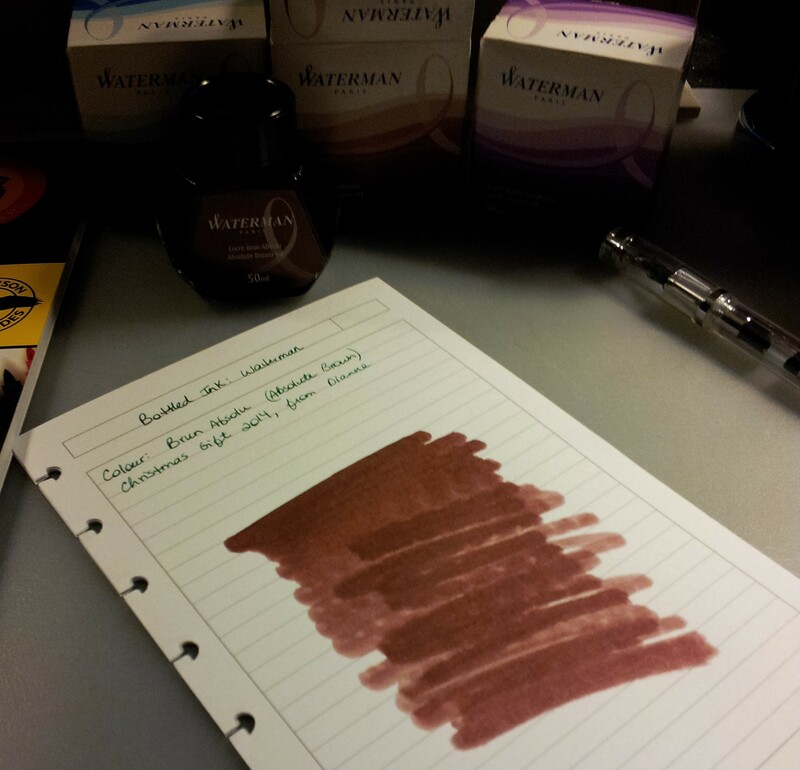 I tested eight fountain pens and found no feathering at all. There is significant show-through but that matters much less to me than feathering. 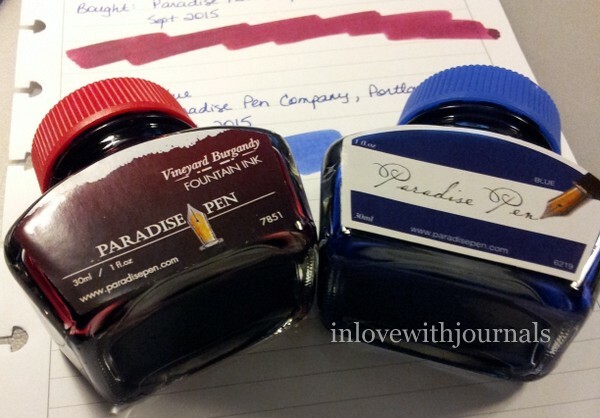 I generally only use the right-hand side for writing in these smaller notebooks anyway. This is a good place to make a break. 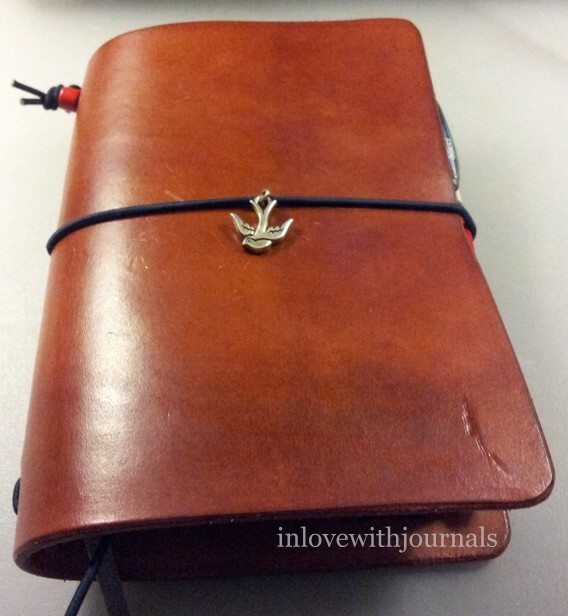 Part 2 will follow next Sunday, when I will discuss in detail the Pocket Pal diary and the Manufactus leather journal. 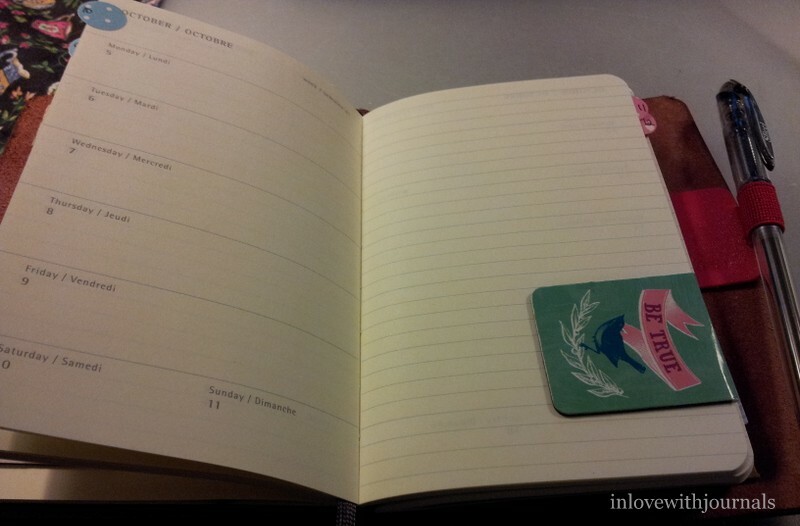 In January of this year I purchased a Filofax Finsbury in raspberry. I was using it until mid-August. I really love this planner but it is too big for the purse I am currently using. And I thought it was high time for a change. So I purchased an 18 month pocket Moleskine in the weekly format. These have been around for ages and I’ve always liked them. I love the small format and the setup is the same as in my Finsbury: week on the left with a ruled page on the right for notes and lists. I thought about a cover for it and thought it might fit into my BroLeatherWorks notebook cover, and it did. I have been wanting to use this cover since I got it in September 2013 for my birthday. It’s a perfect fit. I swapped out the heavy Vade Mecum charm for a little bird which I think suits it better. 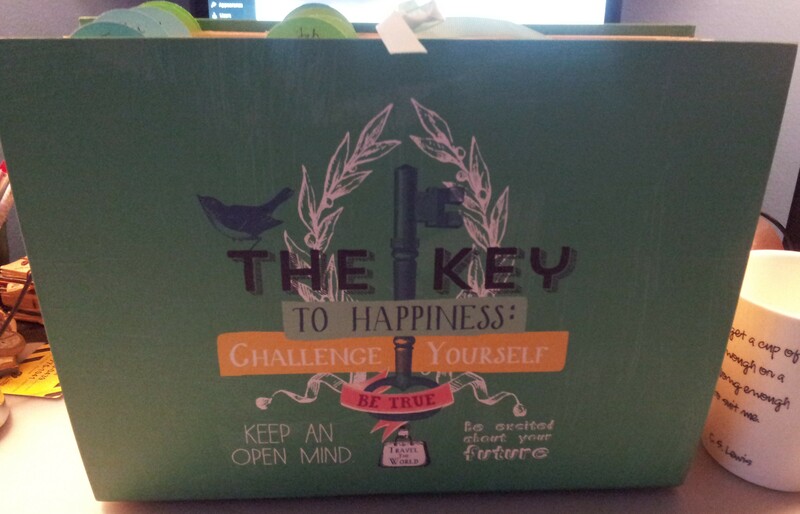 I used a file folder I had made and stuck on some inspirational stickers. I also added a Leuchtturm pen loop, in red to match the red beads on the outside of the leather holder. 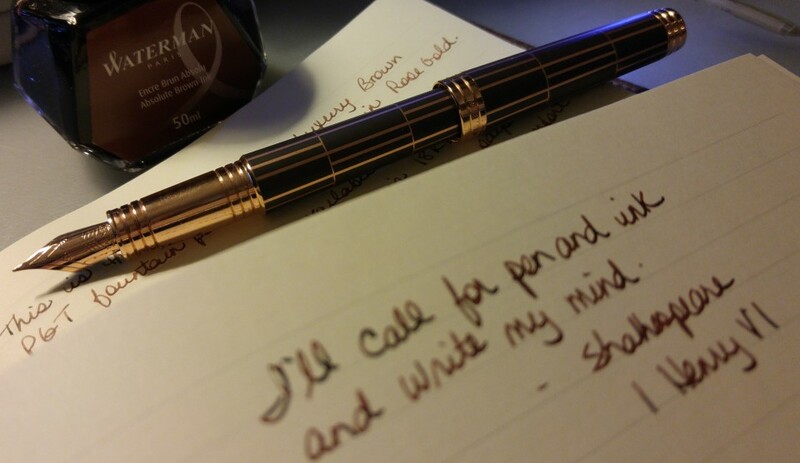 It holds a black 0.4 mm Pentel Slicci. The other side of the folder holds my sticky notes, a paper clip and a small book of Shakespeare’s Sonnets, which I carry with me always. 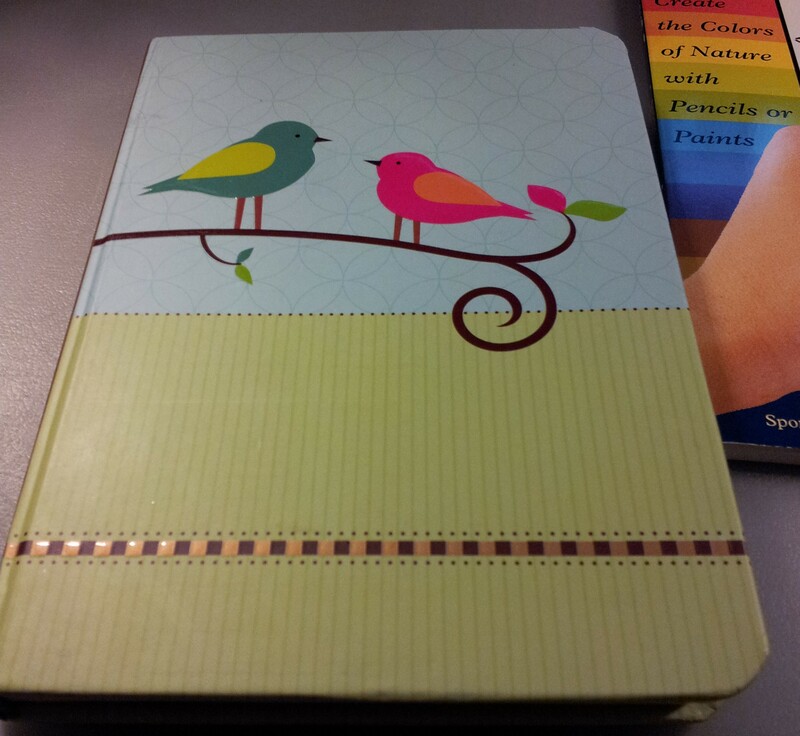 I also put a bird sticker on the front of the Moleskine planner, in keeping with the theme that seemed to be developing. 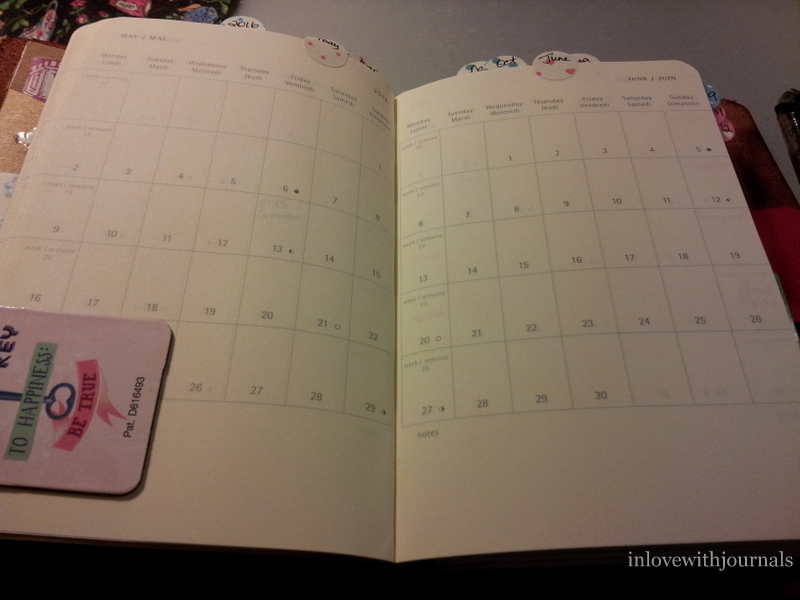 One page is devoted to each month. 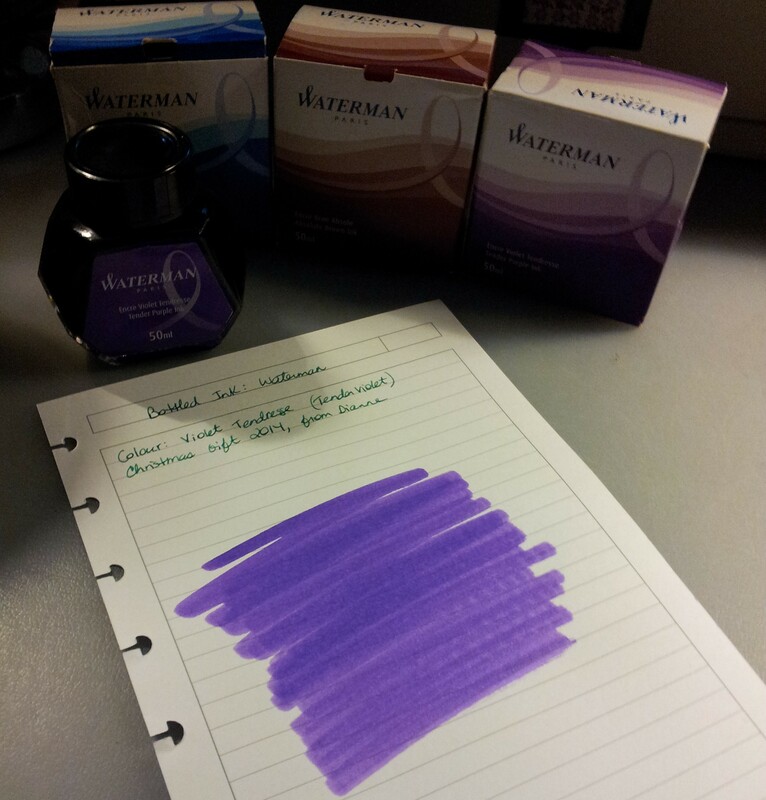 This makes for a very small space to write in appointments; I would prefer a month on two pages. But there is always the weeks section if these squares get full. I use a magnetic bookmark to mark the current month. I also used masking stickers to differentiate between months along the top. The all too familiar week on one page layout. Over the years I have found this layout works best for me. I like to make lists and the ruled right page is perfect for that. Again, I use a magnetic bookmark to mark the current week. The back folder holds page flags and another paper clip. These are some of the fun stickers that come with the Moleskine, in the back pocket. I couldn’t figure out why you would need to remind yourself to blow dry your hair (the red hair dryer sticker) until my friend pointed out that would indicate hair appointment. D’oh! Of course it does. 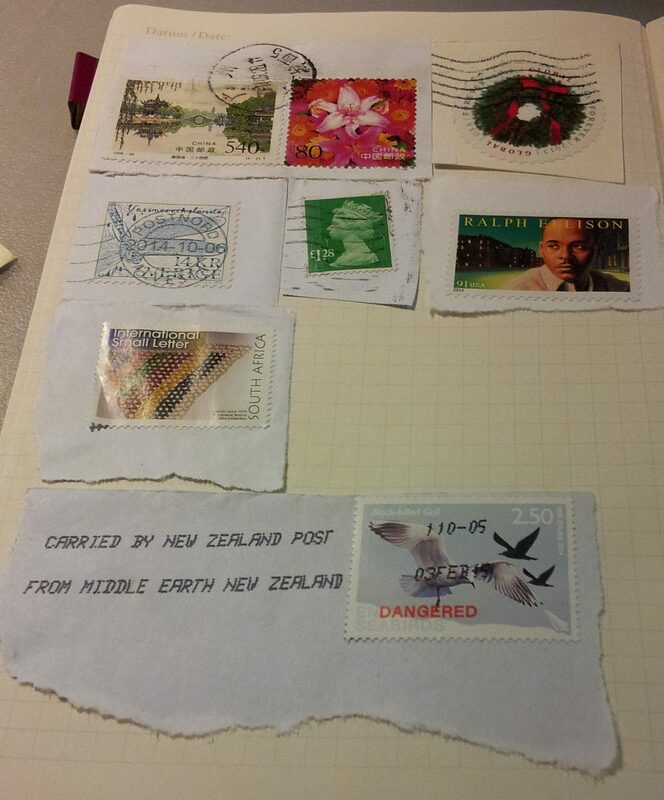 In my post of April 7, 2014 I discussed my involvement with World Mail Panel Postal Surveys. 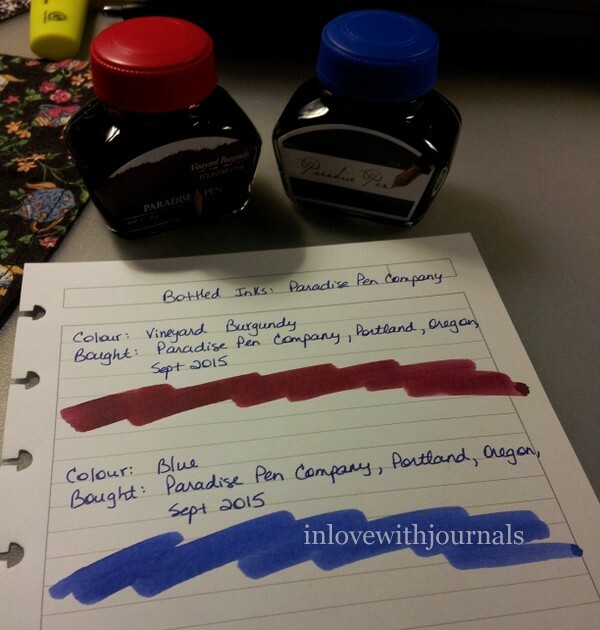 I am still processing surveys for them and I’ve had to start a new journal. 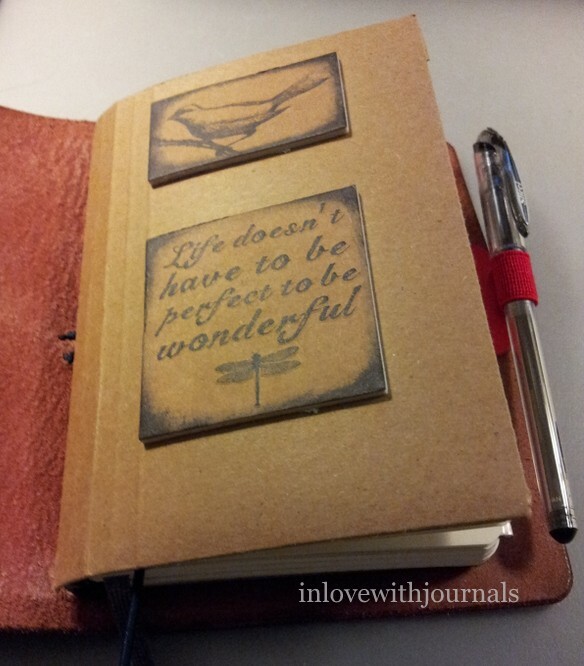 So I thought I would share some pages from the old journal and introduce you to the new one. 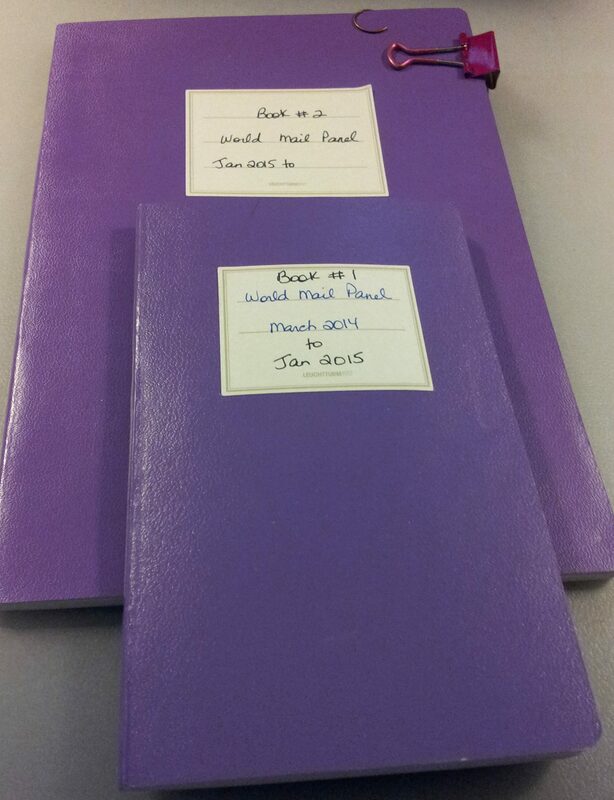 Both the old and new journals are Leuchtturm Jottbooks in purple. The first one was a lined jottbook, approximately 5.8″ (15 cm) x 3.5″ (9 cm), and lasted from March 2014 to the first week of Jan 2015. The second one is grid, approximately 8.25″ (20.75 cm) x 5.75″ (14.5 cm) in size. Because of the bigger size I’m thinking the second one will last a good long time. One of the great things about this program is, obviously, receiving mail from all over the world. And of course said mail have stamps from their countries of origin. I really enjoy the variety of stamps I’ve received so far and I started putting them into the journal, once the suggested retaining time for each survey has expired. 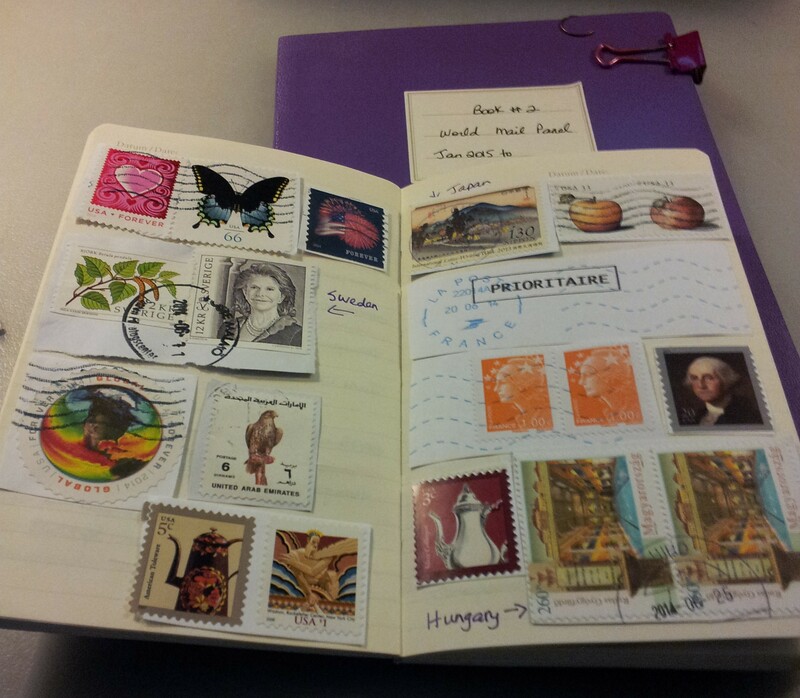 In the new journal I’m putting the stamps at the back, with the intention of working my way backward. 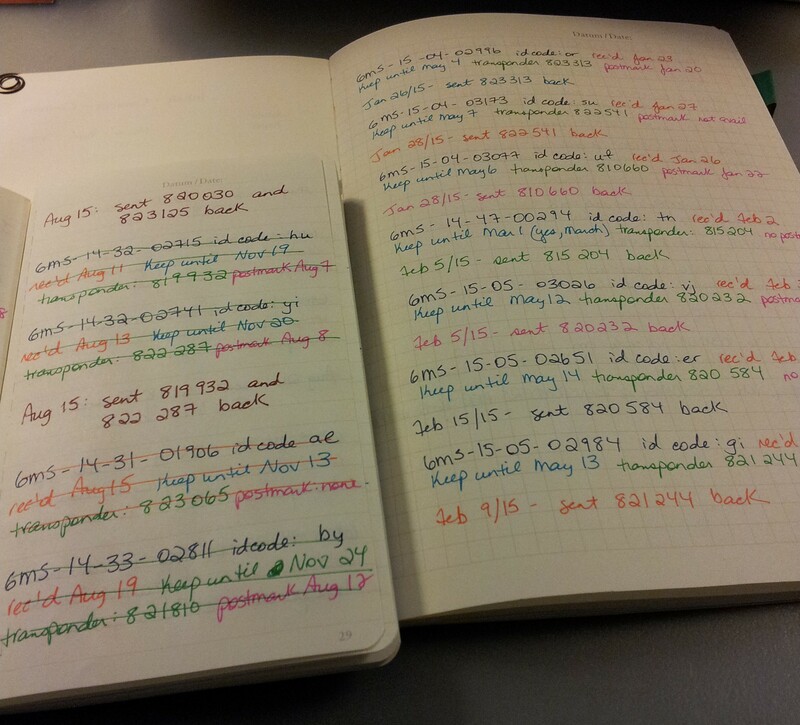 Eventually I will meet the recording pages and have to start a new notebook. These are the recording pages. As each retaining time expires I cross out the entry, stick the stamp in my journal if it’s new, and throw the survey out. As each survey comes in, I record info on their website and then I record the number, id code, when it was received, how long I have to keep it, the transponder number, and the date of the postmark in my journal. Since I don’t keep the stamp with the entry I should probably start recording the country of origin as well. Most of the surveys come from the US. So far I’ve never been contacted about a past survey. And I am not required to record the info in a notebook but sometimes when a bunch of suveys come in I like to have a paper record so I can keep track of those I have entered on the website and those I have not. And if a transponder goes missing (which hasn’t happened with mine as far as I know) I will have a record of when I sent it back to them. This is where I keep the envelopes for returning the transponders, and on the left is a transponder awaiting a mate for its return trip. I keep each survey in this expanding folder from Andrews and Blaine. I attached tabs for each month. World Mail Panel pays me $15 a month to process their surveys. There are a variety of gift cards to choose from (I like Amazon), or you can choose to have a payment made to your PayPal account (I’ve done that too). You can also donate the money to Doctors Without Borders. It’s fun, easy and quick. You can read more about the program and register if you like at this link. 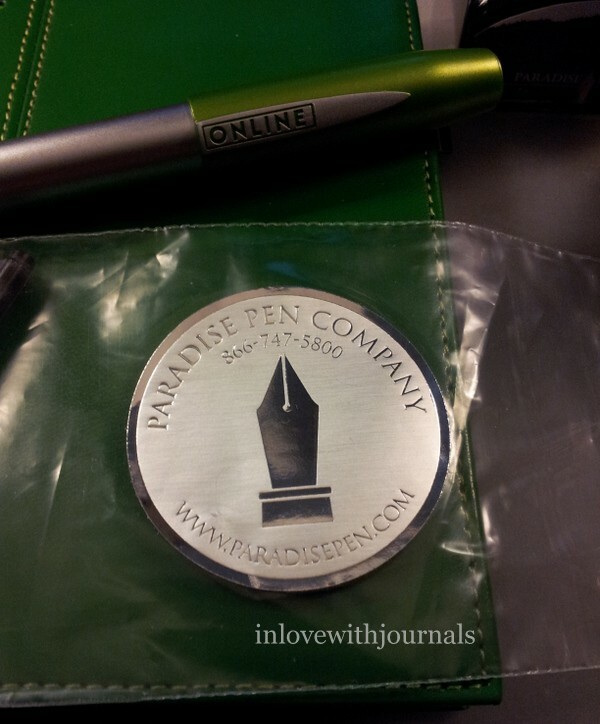 I received my order from The Literary Gift Company, which I talk about here. So many great ideas for that reader/writer on your Christmas list! 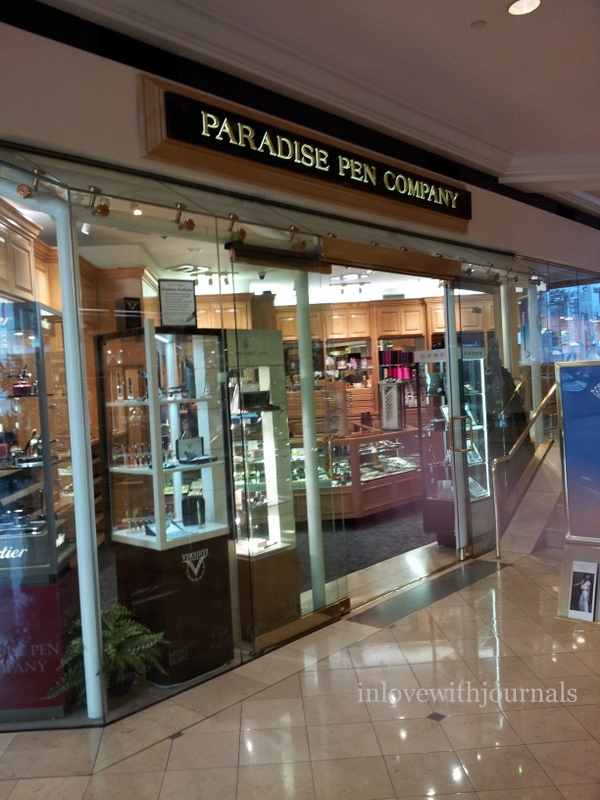 My friends and I went to Reid’s Stationers, my favorite Calgary pen and paper store, last weekend. I bought a number of things, two of which are mentioned above in bold. I will write a blog post about those items and other things I purchased. Lots of changes at work – layoffs and restructuring. Fun times. Still no updates for NaNoWriMo, much to my shame. This is just not my year. Next week I will be on a little holiday so may not post regularly. But I will try.